[2010 Jan] Read Silenced Witnesses Volume II: The Parents' Story and you will know MMR causes autism and serious bowel disease, while the governments have been lying through their teeth (as usual). [2010 Jan] False Testimony Denies Lancet Doctors a Fair Hearing Dr. Salisbury gave misleading testimony regarding the safety of the MMR vaccine and concealed information material to its safety from the public. [2009 Dec] Swine flu jab dilemma: Parents and pregnant women refuse it but experts insist it's safe... so who's right? 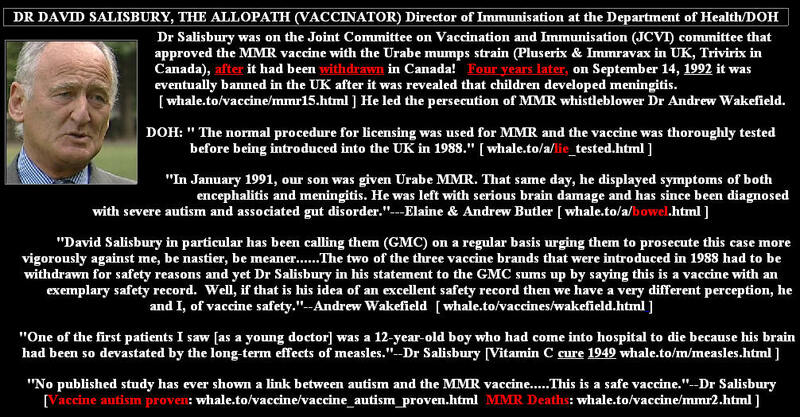 Dr David Salisbury, UK Gov Vaccines Director - Ooops! Never Mind Me, I'm Basil Fawlty! So who now is the Basil Fawlty of the MMR controversy? [Here is a denial classic.] I asked you for evidence that demonstrated that deaths were actually caused by the Urabe strain, and you have singularly failed to provide any evidence whatsoever. You have provided media reports, opinions of parents, and decisions of tribunals or courts. These are not evidence of causality that implicates the Urabe vaccine. Nobody would disagree that deaths have been reported after MMR vaccines. But deaths after vaccination are very different from deaths caused by vaccination. Where dies it leave the GMC if you are not guilty? Very good question on a very broad front. They have some tough decisions to make. One on the level of the case itself, and have they misinstructed their experts, are they going to have to retrench in a different set of charges. They have to take time to structure those charges and get a response from their experts. Are they going to be allowed to do that, I don't know, but it must be becoming obvious to them now that much of the original information they were given, was, had been, misconstrued, and basing their charges on that information has been in error. 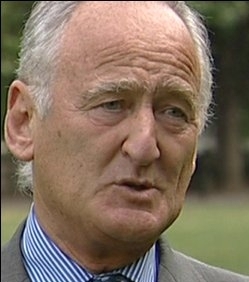 .Dr Alistair Torres who was from the Scottish dept of health, and Dr Torres had been seconded onto the JCVI, effectively from Canada, and he had been brought in, at least in part, to advise on the introduction of MMR vaccine. The experience in Canada was that they introduced a vaccine which contained a mumps component made up of a strain of the vaccine called Urabe, which was originally generated in Japan and they had run into problems with this vaccine. It produced meningitis in children (1:43). 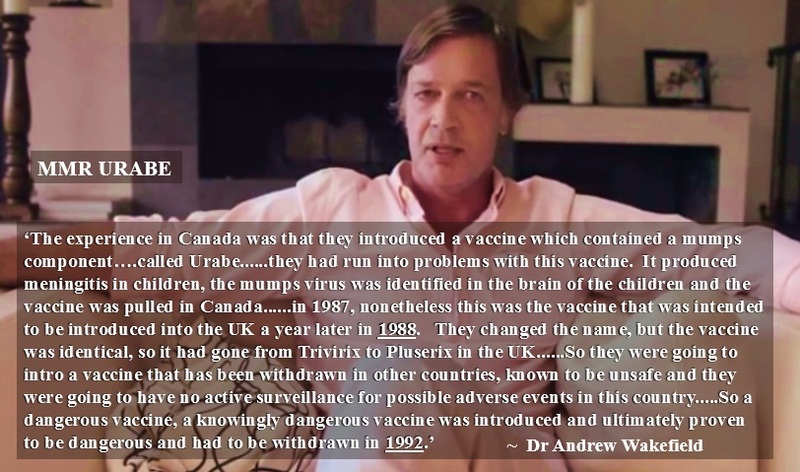 the mumps virus was identified in the brain of the children and the vaccine was pulled in Canada, it was pulled, it was stopped in 1997 (1:53), nonetheless this was the vaccine that was intended to be introduced into the UK a year later in 1988. The other considerable matter which Salisbury onanistically droned on about was his department’s determination to understand public perception of the various vaccinations. He introduced this matter by suggesting that no one else (no other government) in the world was able to track the take-up and public perception of vaccines in the way that the British government could. The data on public perception of vaccine was massive, he said. The survey methods were infinitely sensitive, the government even knew what newspapers respondents read. In all, Salisbury and his colleagues had carried out 30 surveys into the public outlook on vaccination, costing millions of pounds.